Iris De La Cruz, 23, says taking the Metro North from her home in Morris Heights to her job near Grand Central station cuts her commute time in half compared to taking the bus and subway, but she still only uses the line ‘once in a blue’ because it’s too expensive. City Comptroller Scott Stringer wants the MTA to lower the cost of LIRR and Metro-North rides within the city to $2.75, what he says will cut travel times for residents in Queens, Brooklyn and the Bronx where the commuter rail lines operate, but where current fares make them too expensive to be a viable transit option for many, according to a report released Tuesday. Currently, rides on the Metro North and LIRR cost more-per-mile for riders traveling within the city than for customers traveling longer distances to and from the suburbs, City Limits reported in June. The price difference is enough to keep many residents from using the commuter rails, even if doing so would significantly shorten their trips compared to taking the bus or subway. 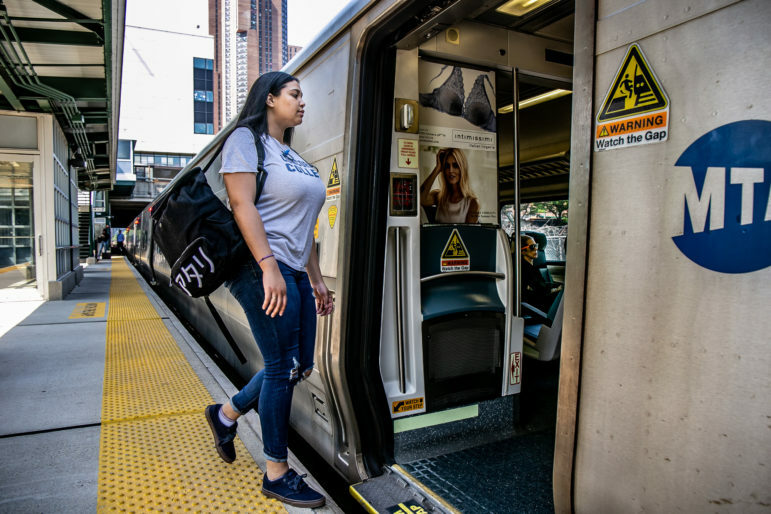 “Financially, it was becoming too detrimental,” Bronx resident Iris De La Cruz told City Limits earlier this year about commuting to work from her home in Morris Heights on the Metro-North, where a one-way peak ticket to Grand Central costs $9.25. She usually opts to take the bus and subway instead, despite the fact that doing so about doubles her commute time. Stringer’s proposal would lower commuter rail fares within the five boroughs to $2.75, the same as a single-ride MetroCard, and would allow free transfers to MTA subways and buses. He also calls for the MTA to increase LIRR and Metro-North service to the 38 local stops in New York City where the lines operate, many of which are in neighborhoods underserved by other public transit options. “New York City’s transit system is in crisis. While commuter rail tracks carve through the Bronx, Brooklyn, and Queens, working New Yorkers are stuck behind an unacceptable paywall, forced to pay an exorbitant amount or spend extra hours stuck on overcrowded subways and buses,” Stringer said in a statement. Commuter trains have the capacity to fit more city riders, he says: the average rush-hour LIRR train has 233 empty seats during peak morning hours and 282 during the evening rush, according to the report. Stringer calls for the new fares to be “phased in” over the next four years, to coincide with completion of the MTA’s East Side Access project, which will expand LIRR service to Grand Central. The comptroller’s proposal would cost the MTA an estimated $50 million per year, though Stringer argues that’s just “a fraction” of what the authority is shelling out to add new subway stations along Second Avenue and at Hudson Yards. “Affordable Metro-North and LIRR service would give New Yorkers more time with their family and friends, cut congestion on our streets and in our subways, and expand economic accessibility for hundreds of thousands of people,” Stringer said. Transit advocates have been calling for reduced commuter rail fares in transit-starved parts of the city for years. The MTA has introduced similar discounts in the past, including the CityTicket, which allows riders to use LIRR and Metro-North lines within the city on weekends for a discounted one-way fare of $4.25. This summer, the MTA began offering the “Atlantic Ticket” which lowers the price of a one-way ride between Atlantic Terminal and nine LIRR stations in Brooklyn and Queens to $5, compared to the current fare of $10.25 during peak and $7.50 during off-peak hours. The initiative is being used as a field study for the MTA to see how the lower fare impacts ridership. In a statement, MTA Chairman Joe Lhota disputed Stringer’s assertion that the city’s commuter trains are underutilized, and called the comptroller’s proposal “irresponsible” because it fails to say how the MTA would pay for the lower fares. The commuter lines are packed by the times the trains cross into NYC. Adding stops in the city will only add time to the commutes of suburban passengers. There already are stops in the city, and local trains already stop there. The issue the comptroller is raising is about the fares charged. Advocates are pushing back against the MTA’s plan to raise fares next year, saying straphangers shouldn’t be forced to pay more until lawmakers secure a plan to fund improvements for the city’s deteriorating transit system. Riders Alliance analyzed how congestion pricing would impact commutes for express bus riders, and found it would shorten start-to-end trip times on 39 express bus routes in Brooklyn and Queens by between 37 minutes to two hours per week. Andrew Cuomo has focused a lot of money and attention on infrastructure. Whether the city’s transit system has received sufficient love from the gov is a matter of much dispute.